Want weekly tips on Parenting with Scripture? Click here. Fight is a bit of an aggressive word and can be construed many different ways. So, I’ll define it as is typical in my marriage. 1. That neither of us was truly mad at the other. 2. That we would resolve the issue before we went to bed. But as I glanced at my two kids sitting on the couch, a thought occurred to me. Did our children know those two things?! I called Tim back and we decided to work it out in front of the kids so they could see how Mom and Dad deal with conflict resolution. Yes, Mom and Dad do have fights/arguments. They’ve seen it before. Sometimes we have to agree to disagree. And that’s ok, too. Then we carried on with our argument turned conversation, allowing the kids to see us work it out. The kids saw Mom and Dad practicing what they preach. They realized conflict resolution is skill they will need all their life, so they might as well keep practicing with siblings and friends! They saw that conflict is normal. The important thing is how it is handled. They heard how the Bible has practical helps in dealing with conflict. The next time a “fight” begins in front of your kids, consider blessing them with a similar teachable moment! PS: Though I think this a great idea and helpful to play out in front of your kids every so often (when appropriate), in general I’m not a fan of arguing or fighting in front of the kids. For more verses, discussion questions, and take action ideas on the topic of “Fighting,” see your copy of Parenting with Scripture: A Topical Guide for Teachable Moments. Your kid a picky eater? You’re in the same club with the penguins! 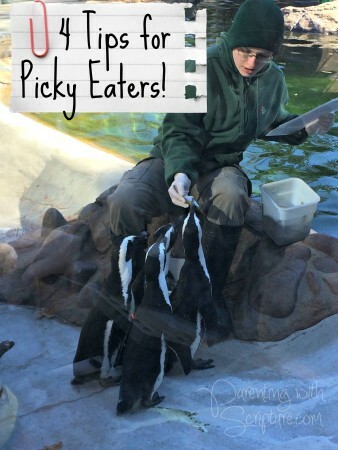 Got a picky eater in your home? I thought you’d find it amusing and somewhat comforting to know that even the animal kingdom has to deal with this! For my 40th birthday, my family treated me to a behind the scenes tour with the penguins at the Ft. Worth Zoo. I am a little (some would say a lot) obsessed with penguins, so this was super special to me! We had the pleasure of watching the zookeeper feed them their afternoon meal of fishies. Guess what we found out?! * Some like one kind of fish. Some like a different kind of fish. * One tests the firmness of each fish, drops it if not satisfied, and waits for another. * One must be handed the fish a certain way or won’t accept it. We’ve had our own share of pickiness here at my house. I am by no means a health expert, have “the best” meals all the time for my kids, or have completely eradicated pickiness. But, I have learned and implemented a few TIPS that have helped. No separate meals for the kids. We all eat the same thing, where they like it or not. I explain that there are some things they may never like. Sometimes we have to eat things we don’t enjoy. I don’t care for tomatoes, but I eat them because I know they are good for me. For politeness (and mainly because my mother ingrained this in me), I’m trying to teach my kids not to say, “I don’t like ______.” Instead, they may say, “I don’t care for ______” regarding a particular food. I think it would be taking things a bit far for me to relate this to Scripture. So, just consider this a shameless excuse for me to share my obsession with penguins with you! These may not work on penguins, but they’ve worked on my kids. When a teachable moment does happen lend itself to God’s Word and you want to find a verse on the topic quickly, don’t forget to use your copy of Parenting with Scripture: A Topical Guide for Teachable Moments. But let’s let our kids in on HOW we are being a good example for them. 2) We can be transparent with our kids about our struggles…keeping in mind appropriateness for age and content. Meaning, we can show them how we are ourselves are working on being a godly adults. They need real life examples of how it doesn’t come magically or without effort. I’ll be transparent with you and show you what this looks like in my family. I love to eat. I’m not large, but I struggle daily to keep from becoming so. My kids know that this is a battle for me because they have seen their bags of chips and snacks completely disappear without a trace before they have had a chance to enjoy them. My son now hides the Nutella jar so I can’t find it. Smart kid. 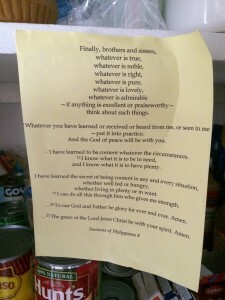 In an effort to deal with this in a healthy way and provide a good example, I’ve posted copies of portions of Philippians 4 on bright yellow paper on my mirror, fridge, and in the pantry at eye level. I know from failing over and over that I have no power of my own in this weakness and must humble myself and rely fully on God. My kids (and I) have the visual that I am trying to remember to use the sword of the spirit, which is the Word of God (Ephesians 6:17), to help me battle this temptation. I pray this helps my kids remember to turn to God’s Word when they struggle! Here’s another tactic I’ve tried. 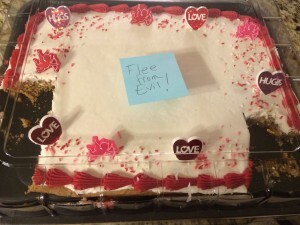 In case you can’t clearly read the post-it, it says, “Flee from Evil!” Ha! I won’t throw my kids under the bus by divulging what their issues are. 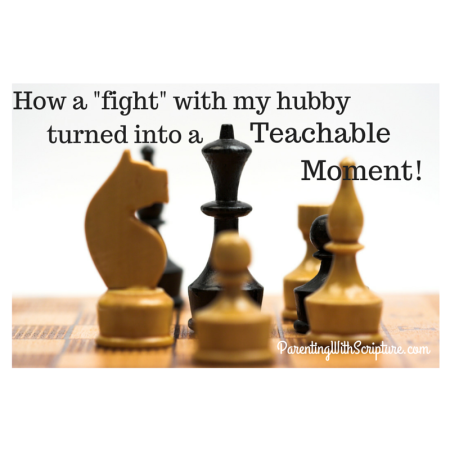 But I’ll share how I’ve incorporated how I deal with my BIG struggle as a teachable moment as an example of helping equip my kids grow into godly adults with their BIG struggle. I was sitting in the car with Kid 1 working on my Bible study while Kid 2 was in an extra-curricular activity. Psalm 119:11 struck me anew because of recent dealings with Kid 1’s struggle and how similar in principle it is to mine. I realized this was a teachable moment! I stopped and shared with Kid 1 that I had just seen a verse that I thought would be a good reminder for both of us! We both need applicable topical verses of God’s Word in our hearts because temptation can strike at any time! I’m not going to always be standing in the pantry with those self- control verses in front of me to help me! I need one or two memorized so they can help me at any point! I explained that was the same reason our family had been memorizing a verse a week on the topic of Kid 1’s BIG issue. Though that particular thing is more of a battle for that child, it’s something we all face. We never know when the temptation is going to strike, so we all need to have God’s Word already in our hearts to help us fight! 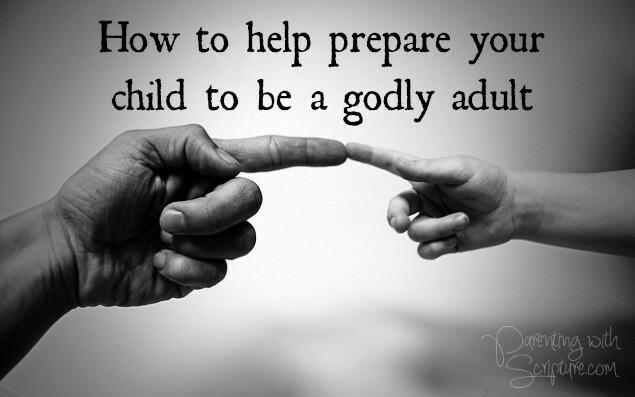 How are you helping your kids see the HOW of being an adult seeking after God? Topical Scriptures to help both children and adults (because we don’t outgrow God’s Word!) can be easily found in Parenting with Scripture: A Topical Guide for Teachable Moments. You artsy folks may appreciate this rendition of Michelangelo’s “The Creation of Adam” from the Sistine Chapel. I like the imagery of it connected to the topic of this blog. 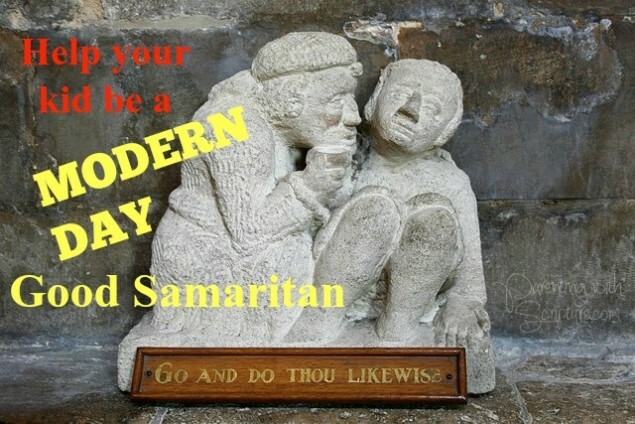 Help your kid be a Modern Day Good Samaritan! Are we going to teach our children to pass on by or help when possible? Notice that others were passing on by UNTIL the Burrages stopped to help. THEN, others followed their kind example. I want my kids to be the sort that stop and help and even positively influence others in the process, don’t you? – Stopping to let a co-worker know you are praying for a difficult situation in his life. – Being ready to act when an opportunity presents itself! your hand is God’s hand for that person. For more verses and ideas how to expand this idea, see the topic “Kindness” in your copy of Parenting with Scripture: A Topical Guide for Teachable Moments. Inerrancy – Is God's Word for Real? "If you can't sleep, just rest." "Just smile and be nice." "We don't hate, we strongly dislike." "But I already prayed today!" Did you know your eyes are sticky? Do you know the secret of being content? Is work a good or bad thing? Is your life or our pet's more important? What would you do if…? Why can't we go to church? Are you your child's cheerleader? Does he/she know that? Do I know the secret of being content? Do I live in a neighborhood or strangerhood? Do you ever feel like a parent fail? How am I building a legacy of "sincere faith?" How do my children view aging? Want a tip that can positively impact your child's behavior and self-image? What do you do when nothing else works with your kid? What is your child's biggest temptation and what are you doing about it? Winter – Snow Much Fun! Sin can grow like a weed! "Let's thank God for what we have, not wish for what we don't." Thankful Turkey: How-to with free templates! How do my children view growing old? Want weekly tips on Parenting with Scripture?